Figure 1: Structures of typical KHIs. Each monomer has an amide group. 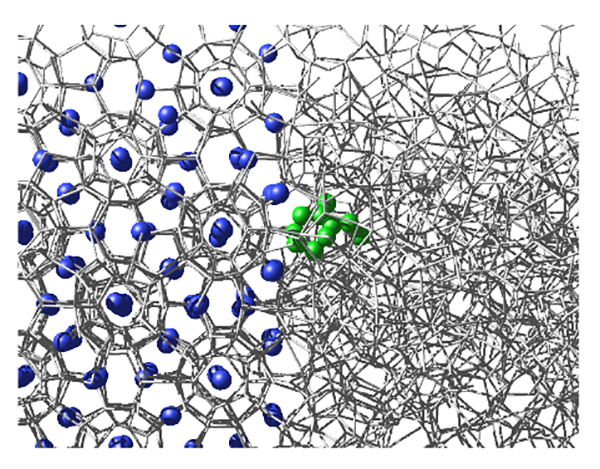 Figure 2: Snapshot of a monomer of a KHI, PVCap, at the interface between structure II methane hydrate and liquid water. The hydrogen bonds between water molecules are represented by gray lines. The green molecule is the monomer of PVCap and blue spheres are methane molecules in the hydrate phase. Figure 3. Free energy profile for transferring a PVCap monomer from the bulk liquid phase to the hydrate surface (solid). 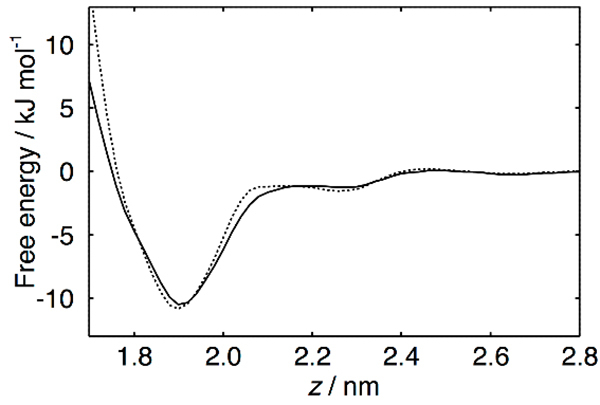 The figure shows that the monomer is stabilized at the hydrate surface by 10.5 kJ mol-1. The dotted curve is the free energy profile of a fictitious nonpolar PVCap monomer. The adsorption affinity of the fictitious nonpolar PVCap monomer is almost the same as that of the normal PVCap monomer, although the former cannot form hydrogen bonds with water molecules. This result clearly demonstrates that the amide hydrogen bonding does not contribute to the adsorption of KHIs on the hydrate surface. Gas hydrates are crystalline solids which consist of water and guest molecules such as methane. Gas hydrate ‘plugs’ sometimes occur in gas and oil pipelines. This is a serious industrial problem because the pipeline must be shut down until the hydrate plugs are removed. A common way to avoid the plugging is by using a dosage of a type of water-soluble polymers called ‘kinetic hydrate inhibitors’ (KHIs). KHIs bind to the hydrate/water interface and inhibit the crystal growth of gas hydrates. Scientists believe KHI adsorbs on the hydrate surface mainly due to hydrogen bonding between the amide groups of the KHI and water molecules on the hydrate surface. Takuma Yagasaki, Masakazu Matsumoto, and Hideki Tanaka at Okayama University, Japan, performed molecular dynamics simulations on KHI binding, demonstrating that the conventional picture of the adsorption mechanism of KHIs is incorrect. The team calculated the free energy profiles of various molecules using an umbrella sampling technique with the weighted histogram analysis method. 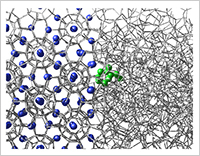 They discovered that the adsorption of nonpolar or weakly polar molecules, including KHIs, on the hydrate surface is largely due to entropic stabilization arising from the presence of cavities on the hydrate surface. The amide-hydrogen bonding makes no contribution to the adsorption affinity. The researchers believe the mechanism found in this study will help in the development of new KHIs in the future. ・Authors: Takuma Yagasaki, Masakazu Matsumoto, and Hideki Tanaka. ・Title of original paper: Adsorption mechanism of inhibitor and guest molecules on the surface of gas hydrates. ・Journal, volume, pages and year: J. Am. Chem. Soc. 137, 12079 (2015). ・Affiliations: Department of Chemistry, Faculty of Science, Okayama University. OKAYAMA UNIV. e-Bulletin. Theoretical physics: Demystifying the molecular mechanisms of the initial stages of how ice melts. Vol.4, Sep, 2013.